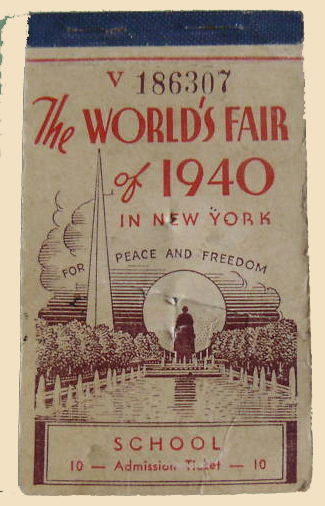 I was born in 1952, seven years after the end of World War Two. There were still obviously signs of this devastating war all around while I was growing up; and when my parents moved to the south of England and rented a house in 1960, we discovered an air-raid shelter in the garden whose interior had been left intact from the day it was no longer needed fifteen years before. My sister and I have many happy memories playing in it and reading all the books and magazines that had been left there. Great Britain in the early 1950s was still recovering from the War, with bomb-sites all around, and rationing in force until 1955. 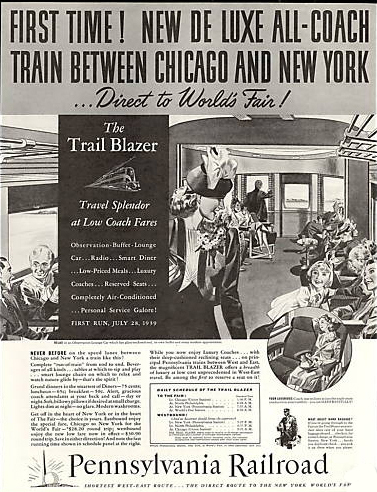 The 1930s, by comparison, before the War, were seen as a time of peace and prosperity. 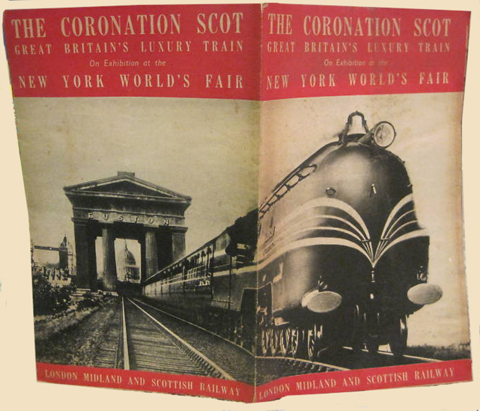 British industry was in its heyday and the British Empire was the world’s greatest. 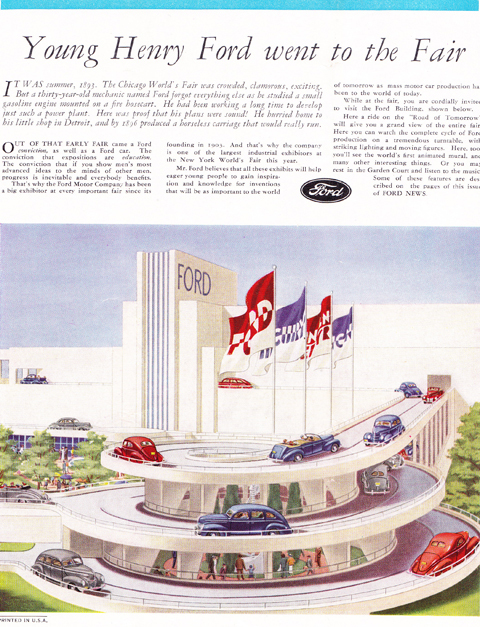 Nevertheless, the United States was a major competitor and, in the field of automotive design, it had already overtaken Britain in the thirties with fantastic, futuristic, streamlined automobiles becoming the absolute epitome of vehicular opulence. 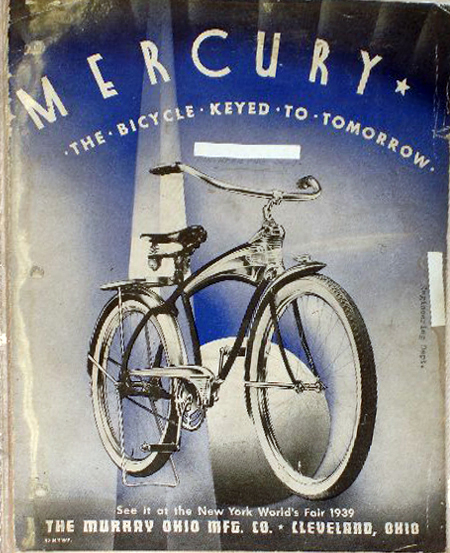 In America, Mercury was a well-established automobile model, made by Ford. 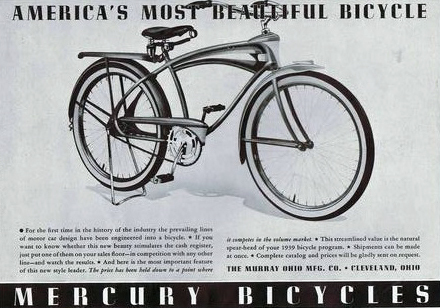 But the most famous two-wheeled Mercury was made by Murray Manufacturing Co, of Ohio, USA, at one stage the world’s largest bicycle manufacturer. 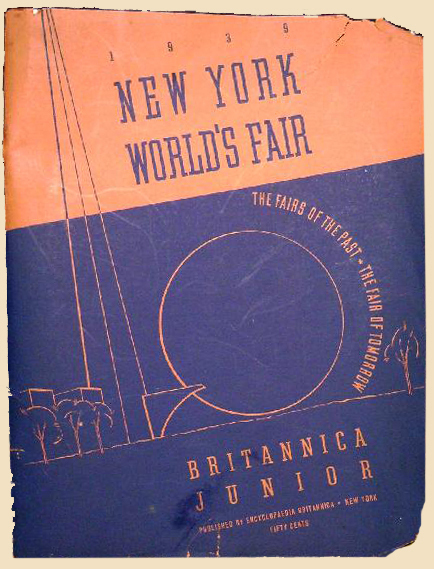 The Mercury Pacemaker was the ‘official bicycle’ of the 1939 New York Worlds Fair and several were on display in the MAN Building at the Fair. 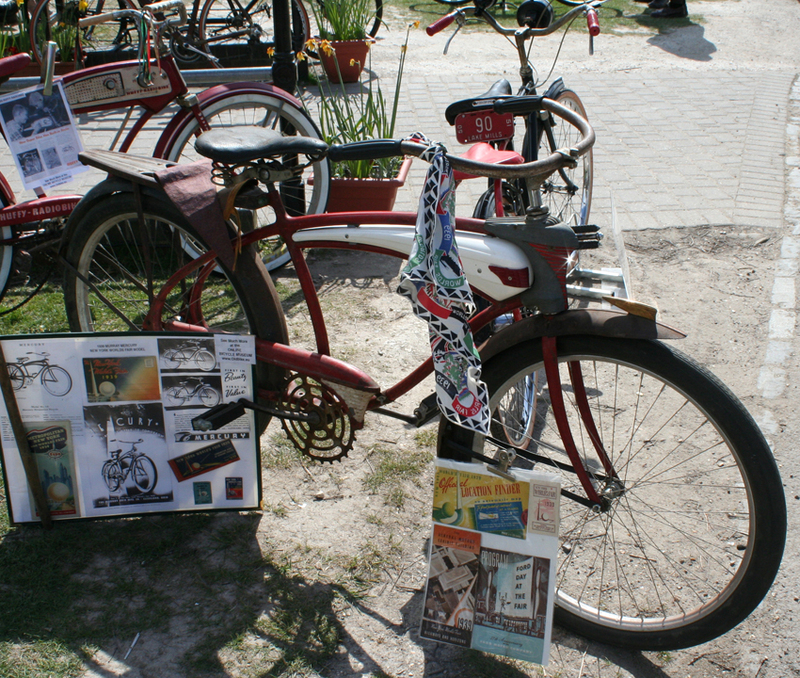 This model is one of my favourite American bicycles. I bought this 1939 Mercury Pacemaker in America in 2008. 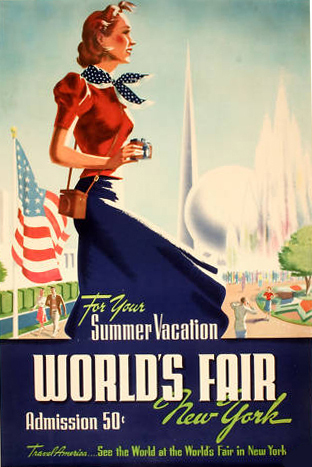 Designed by Viktor Schreckengost, Murray’s chief designer, this streamlined model was launched to much acclaim at the 1939 New York World’s Fair. It was certainly the only Mercury with lights in the tank. The previous model of Mercury had been designed by the equally renowned designer Count Alexis de Sakhnoffsky. 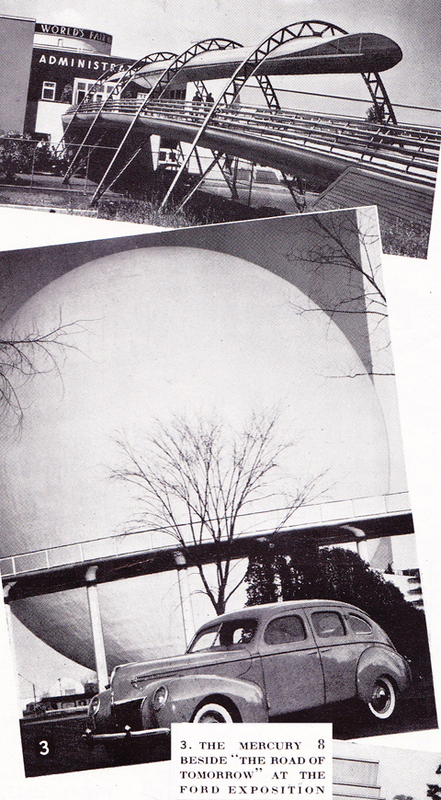 (You can see pictures of the 1936-1938 Mercury further down the page). 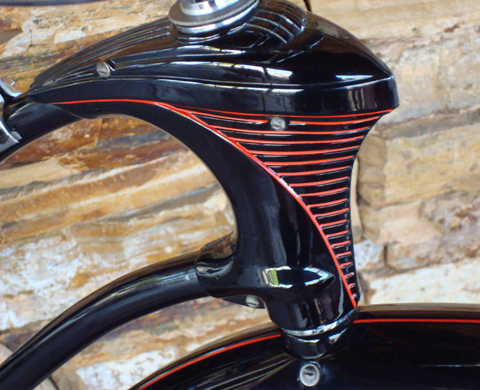 It featured a headlight pod above the handlebars that was a radical design statement. When Viktor took over styling duties in 1938 for the new model, there was obviously some pressure on him to go one better …and to create a new radical headlight feature. 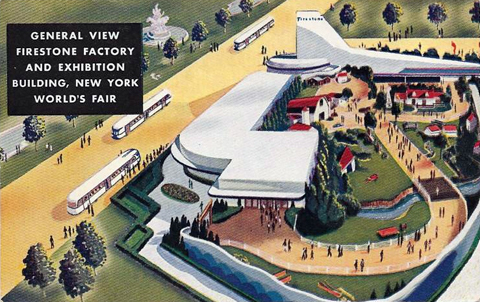 Viktor Schreckengost was one of America’s most prolific designers. He died in 2007, aged 101. 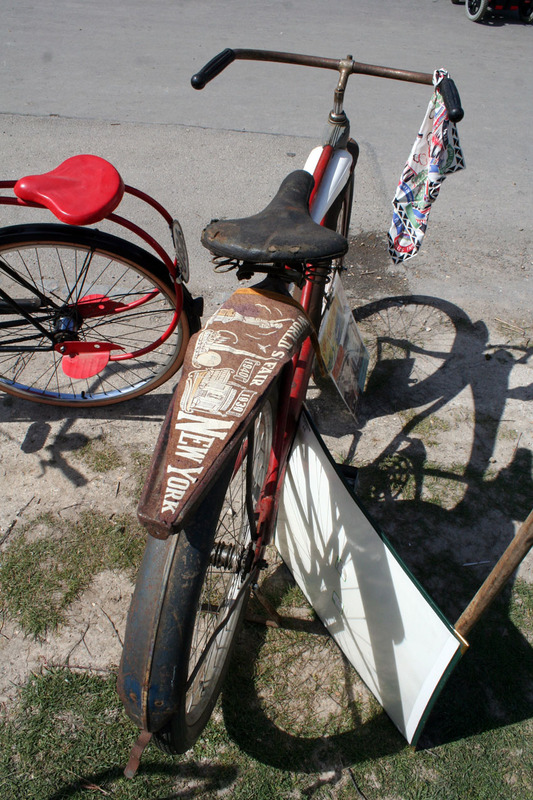 My American friend Jerry, a keen bicycle collector, visited Viktor in the early 1990s. Viktor must have been in his eighties then, and he remembers being impressed by the fact that Viktor’s wife was half Viktor’s age! 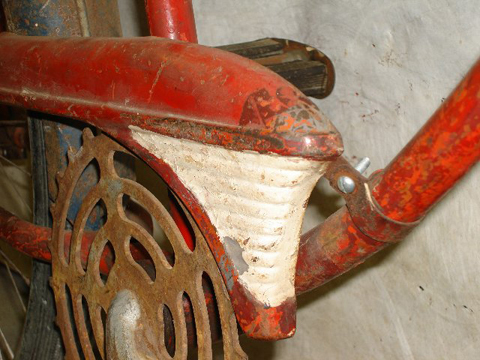 Compare the chainguard above with front of the tank below. Which inspired which? It’s an interesting design detail; often when you see a complete vehicle for the first time, you don’t necessarily notice parts that complement each other, as they blend in so well. 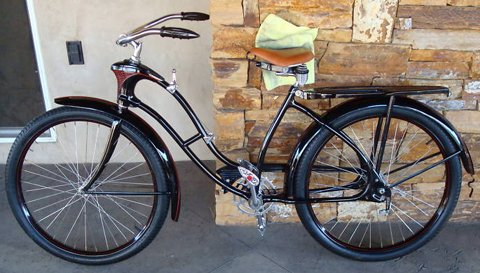 Not many of this 1939 model were sold, so it is very rare now. 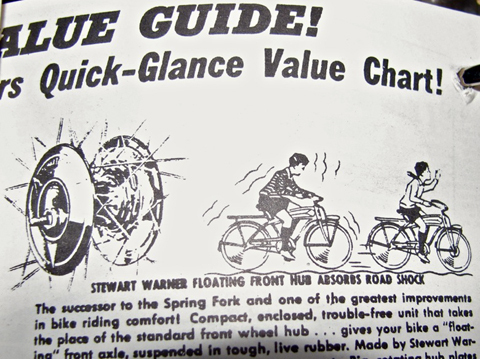 By 1940, WW2 had begun, and the bicycle manufacturers were undoubtedly examining various business strategies in the event of America joining the War. 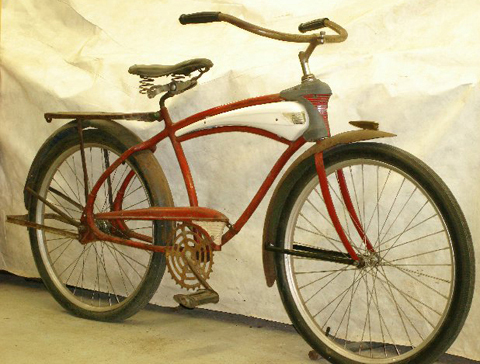 The model was carried over through 1940 and 1941 with slight variations (I think the 40/41 model had a tail light fitted to the rear carrier and maybe the 1941 had a floating front hub). With scarcity, some parts on this particular mens model have been remade. 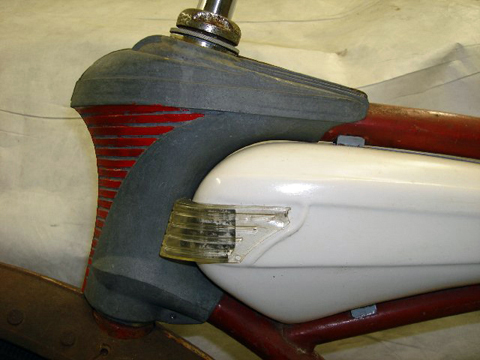 It has a reproduction tank made of fiberglass, with exact tank dimensions and mounting brackets. 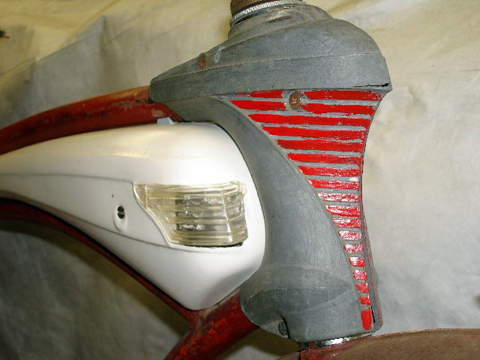 The dual headlight lenses in the tank are reproduction too, and they are both slightly damaged. 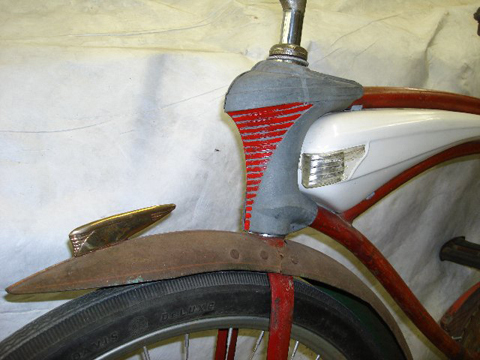 You can tell that such work was carried out some time ago, as the cost would be prohibitive to do this now. 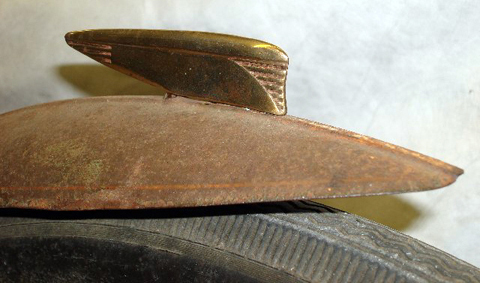 The Streamline fender ornament is also extremely hard to find, and this one is a reproduction made of bronze. 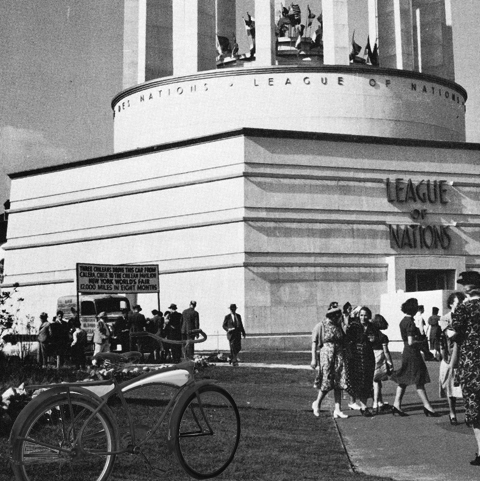 Below you can see where I parked the bike as I wandered around the League of Nations Building at the 1939 Worlds Fair. 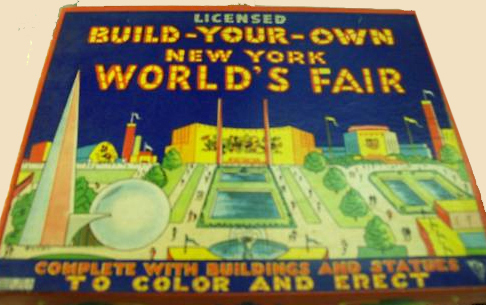 The Worlds Fair Pacemaker model was the most luxurious of the 1939 Mercury range. 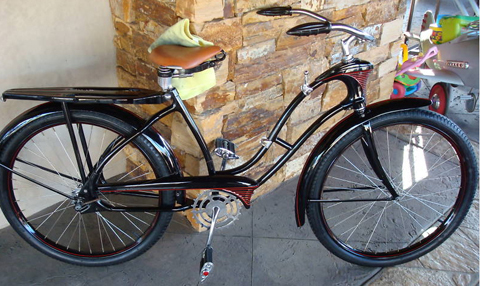 There were several variations: here are some photos of a restored 1939 Mercury Girls bicycle for comparison (pictures from the internet). Somewhat off-subject as it has four wheels not two, but to many people, if you mention the name Mercury, they think of the Ford Mercury 8. 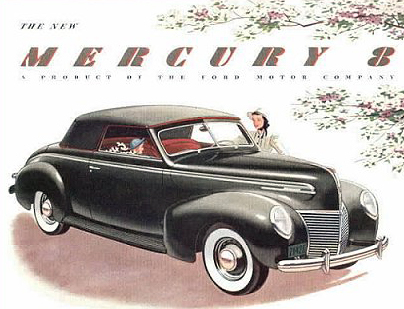 Ford introduced the Mercury range in 1939, in order to compete in the medium-priced part of the market. 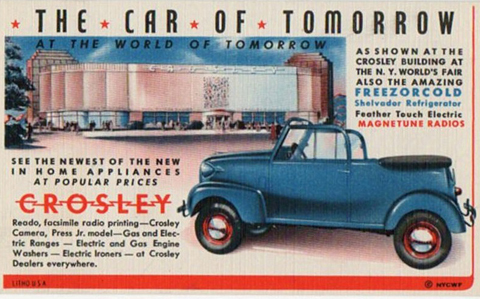 Although Ford performed well in the lower price range, and the company had purchased Lincoln to give them a presence in the top end of the market, GM fielded models across the whole of the market, which gave them the edge on annual sales. Edsel Ford introduced the Mercury – essentially, a more luxurious version of the Ford – to compete directly with Oldsmobile and Buick. 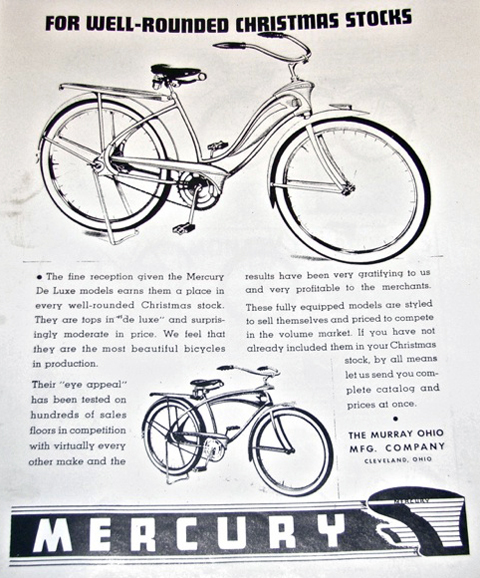 It’s interesting that the Murray Mercury bicycle was launched at the 1939 Worlds Fair, and a Ford that shared its name, making its debut in the same year, was also featured at the Fair. I wonder if any motoring journalists of the time noticed that interesting connection? I’ve never seen it mentioned. 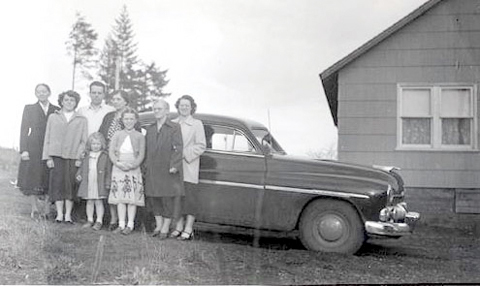 For many vintage enthusiasts, one of the most iconic postwar American cars was the 1949 to 1951 Mercury Coupe – James Dean died in a Porsche, but lived in a Merc (eg Rebel Without a Cause). The ’49 Merc became the definitive ‘leadsled’ custom car.